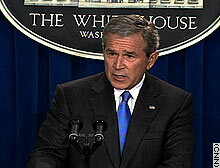 President Bush Monday said success in Iraq is vital to the global fight against terrorism. WASHINGTON (CNN) -- Citing Iraq as a key example of U.S. resolve in "a global war" on terror, President Bush said Monday there would be no quick U.S. exit despite the strain of the war on American society. "If we ever give up the desire to help people who want to live in a free society, we will have lost our soul as a nation," Bush said. In a Washington news conference, the president tied Iraq to the war in Lebanon and Iran's nuclear ambitions as instances where the United States and the world must make strong stands in the global struggle against terrorism. And he said the war must be fought in Washington, too, criticizing a federal judge's ruling last week to stop the National Security Agency's domestic eavesdropping program, which was instituted after the 9/11 attacks. "They see maybe these kind of isolated incidents. These aren't isolated incidents; they're tied together. There is a global war going on," he said. "These are challenging times and they're difficult times. And they're straining the psyche of our country." But defeat in Iraq is unacceptable, Bush said, because of the physical and psychological boosts it would give to terrorists. "A failed Iraq in the heart of the Middle East will provide safe haven for terrorists and extremists. It will embolden those who are trying to thwart the ambitions of reformers. "In this case, it would give the terrorists and extremists an additional tool besides safe haven, and that is revenues from oil sales," the president said. "Leaving before the job is done would be a disaster," he said. In a new CNN poll released Monday, opposition among Americans to the war in Iraq has reached a new high, with about a third of respondents saying they favor it. The poll was conducted by the Opinion Research Corporation for CNN. The top Democrats in the House and Senate on Monday each called for a "new direction" in Iraq. Rep. Nancy Pelosi, the Democratic leader in the House, said Bush "should have given more thought to the consequences of a failed state in Iraq before he launched his ill-advised invasion." And Senate Minority Leader Harry Reid called Bush's strategy in Iraq "a failure." "Far from spreading freedom and democracy in the Middle East, the Bush administration has watched while extremists grow stronger, Iran goes nuclear, Iraq falls into civil war and oil and gas prices skyrocket," the Nevada Democrat said. "Simply staying the course is unacceptable. We need a new direction in the Middle East, especially in Iraq, where the president's failed policies have made America less safe." Keeping with his call for the world to stand up against terrorists, Bush said there must be an effective international force in Lebanon to ensure Hezbollah doesn't re-arm and "wreak havoc in the region." "The international community must now designate the leadership of this new international force and give it robust rules of engagement and deploy it as soon as possible to secure the peace," Bush said. Besides helping organize an international force, Bush said U.S. efforts in Lebanon include getting food and energy aid to residents and aiding in rebuilding homes and schools damaged or destroyed in the 34 days of fighting between Israel and Hezbollah guerrillas. Bush also announced aid to help Israeli civilians recover from Hezbollah rocket strikes. But most important is that the U.N. have the troops and the mandate to make sure southern Lebanon is not a safe haven for Hezbollah, he said. "You can't have a democracy with ... an armed political party willing to bomb its neighbor without the consent of its government," Bush said of Lebanon. About 3,000 Lebanese troops and a handful of international troops -- the first in a force of 15,000 -- have moved into southern Lebanon to ensure Hezbollah does not launch rockets into Israel. Bush cited Iranian support for Hezbollah, which the U.S. considers a terrorist organization, as one example of why Iran cannot be permitted to have nuclear weapons capability. "Iran is obviously part of the problem," Bush said. "They sponsor Hezbollah. They encourage a radical brand of Islam. Imagine how difficult this issue would be if Iran had a nuclear weapon. "So therefore it's up to the international community including the United States to work in concert for effective diplomacy. And that begins at the United Nations Security Council," Bush said. The Bush administration reiterated Monday that Iran must adhere to an August 31 deadline to halt uranium enrichment or face U.N. sanctions. Monday's news conference was Bush's first in Washington since June, but he also had a news conference in Chicago, Illinois, July 7.